Dario Argento is one of my favorite directors. He may not be great with plot and characterization but he makes up for that in adding to his films everything that makes a horror or thriller film entertaining, suspenseful, beautiful, and scary. His directorial debut is no exception. He takes the basic premise we see in most of his films – an American hero, an artist, witnessing a crime scene and investigating. We have the black gloved killer, the amazingly executed death sequences, the absorbing and surprising mystery, setting it all in beautiful locations and including his stylish directing. Contrary to what most people say, I don’t think all the actors in Argento’s films are terrible, they just usually have terrible dubbing which makes the actors look very bad. But in this film, actors such as Tony Musante and the gorgeous Suzy Kendall are great at showing their many emotions. I was with Sam all the way in his difficult and dangerous investigation. I too was obsessed with finding out what was behind it all, and every time he came to an obstacle, I felt just as frustrated and scared as he did. We also have a pretty menacing villain. The trench-coat wearing, black gloved killer was very creepy, even if by now pretty clichéd. In the death scenes, it showed that this psychopath was a perverted, violent freak that loved toying with his victims. The creepy voices during those phone calls also helped a lot in making me fear the killer. Every death and/or stalk scene had me feeling exactly what the victim felt. Argento is amazing at this kind of thing. And yes, throughout the whole film you will be puzzled as to who is behind this trench-coat and why. When you find out, you will not be disappointed. I’d also like to give special mention to Ennio Morricone’s haunting score. We all know that rock band Goblin usually score Argento’s films, and we love that. But we can’t forget that Morricone was responsible for the haunting scores of this, CAT O’ NINE TAILS, FOUR FLIES ON GREY VELVET, THE STENDHAL SYNDROME, and the very disappointing PHANTOM OF THE OPERA. 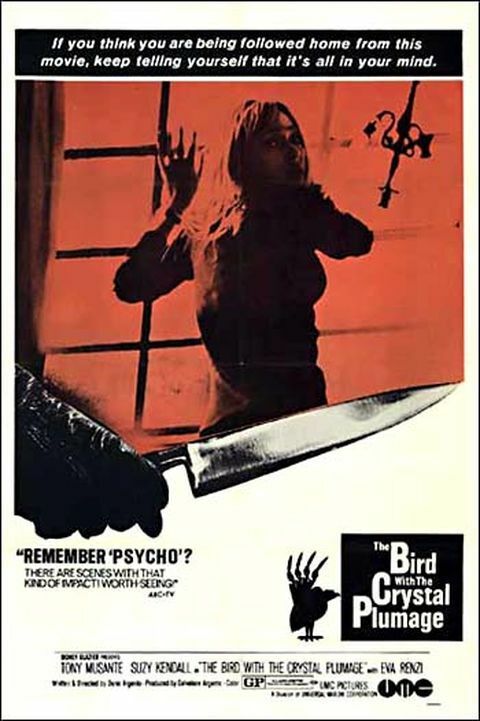 In conclusion, if you are an Argento fan, or a potential fan, this is definitely a film to seek out so you can see Argento’s directorial debut and see how he was on top of the thriller genre from the get-go.